KANEKA Endonuclease is a genetically engineered endonuclease. It cleaves efficiently all kinds of DNA and RNA into small fragments, irrespective of single-stranded, double-stranded, linear, circular or supercoiled. The enzyme can be used for various applications, such as removal of DNA/RNA from solutions, reduction of cell lysate viscosity caused by nucleic acids, and so on. KANEKA Endonuclease is originating from the microorganism Serratia marcescens, and expressed in Pichia pastoris. A few amino acids substitution is introduced to avoid N-glycosylation, but it did not make any impacts on the original enzyme characteristics. KANEKA Endonuclease is a homodimer of 27 kDa subunit with a calculated pI of pH6.6, and Mg2+ is required for enzyme activity. The host strain Pichia pastoris is a yeast species and is free of endotoxins. 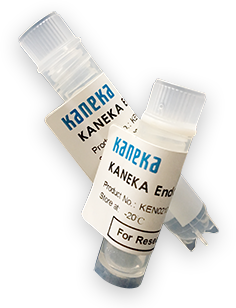 All the raw materials used for KANEKA Endonuclease manufacturing are free of animal origin and BSE/TSE free. No antibiotics are used in the manufacturing process. KANEKA Endonuclease is for research use only. Please feel free to inquire bulk amount and/or GMP grade products. KANEKA Endonuclease is supplied in two different packaging sizes as blow. For bulk amount and/or GMP grade products, please make inquiry. The performances of KANEKA Endonuclease are shown below. The competitor’s product was used for reference in several tests. KANEKA Endonuclease has been stored at different temperatures and the enzyme activity was measured at regular intervals. Based on the results of the stability test and also the results of the accelerated stability test, the shelf life time of KANEKA Endonuclease is set more than 24 months at -20 ºC from the product release date. KANEKA Endonuclease is rather stable, but storage under extreme conditions will lead to activity loss. The optimum storage temperature is -20 ºC. KANEKA Endonuclease has high nuclease activity and is generally applied for removal of contaminant DNA and viscosity reduction. Here describes an example of viscosity reduction application. E. coli cells were suspended in 1L of Tris-HCl buffer pH7.0 to obtain a suspension of OD600 = 100. 10ml of 1M MgCl2 was added. 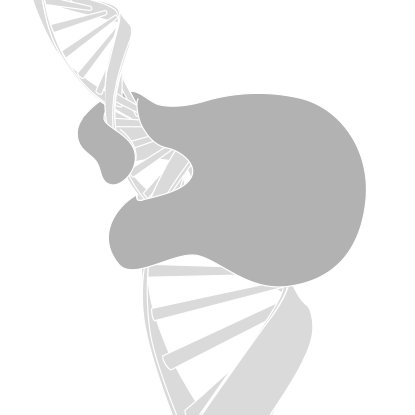 KANEKA Endonuclease was added to obtain a final concentration of 100 U/ml. The cells were lysed on ice with an ultrasonic prove for 30 minutes. The lysate was incubated at 37 ºC for 30 minutes. Following centrifugation at 12,000 x g (15 min., 25 ºC), cell lysate with low viscosity was obtained. KANEKA Endonuclease can be removed by various methods. One of the highly efficient method is a chromatography during downstream process. By setting appropriate conditions, only the target molecule binds to chromatography resins and KANEKA Endonuclease passes through, or both molecules bind to chromatography resins but elute separately. Alternatively, other methods like ultrafiltration might be applied for removal of KANEKA Endonuclease. Since the removal efficiency is depending on the conditions, preliminary tests are highly recommended. The amount of KANEKA Endonuclease in sample solutions can be detected and quantified by the Benzonase® ELISA kit II (Merck Millipore). The kit consists of an antibody coated microtiter plate that specifically captures endonucleases from Serratia marcescens. After adding horseradish peroxidase conjugated antibodies and TMB, Yellow complex is formed as depending on amount of endonucleases. The reaction is stopped by the addition of 0.2 M H2SO4 and the result can be measured by using an ELISA plate reader at 450 nm. Both Serratia marcescens endonucleases showed similar absorbance spectra at 450 nm (Figure 7). This indicates that there is no significant difference in binding affinity between the two endonucleases. Therefore, the Benzonase® ELISA kit II can be used for the quantification of KANEKA Endonuclease.